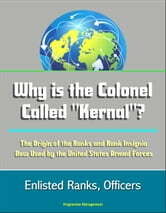 Why is Colonel pronounced "kernal"? Why does a Lieutenant General outrank a Major General? Why is Navy Captain a higher rank than Army-Air Force-Marine Captain? Why do Sergeants wear chevrons? Was John J. Pershing a six-star General? 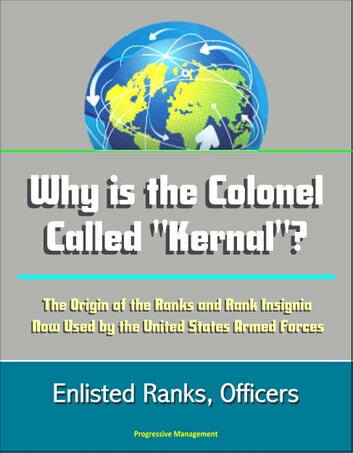 Raymond Oliver, in answering a request from a colonel as to why her title was pronounced "kernal" and where her eagle insignia originated, began this booklet to trace development of general categories of ranks. Mr. Oliver produced the original booklet independently, but when requested to have it printed as a special study, eagerly cooperated, A few minor editorial changes and corrections have been made to the original draft, first published in 1982. The booklet, in the interest of space, is not footnoted but a list of sources follows the narrative. The military, it is hoped, will have a deeper appreciation for his or her insignia and wear it proudly. Civilians unfamiliar with the rank structure of the military will find this booklet helpful in answering questions of what can be confusing to the neophyte. The U.S. military services still use many of the ranks they started with when they began in 1775 at the start of our Revolutionary War. The leaders adopted the organization, regulations and ranks of the British army and navy with just minor changes. This is not surprising because our Revolutionary Army was made up of colonial militia units that had been organized and drilled by British methods for many years. Most of the military experience of the soldiers and their officers, George Washington among them, had come from service in militia units fighting alongside British army units during the French and Indian War of 1754-1763. The British navy was the most successful in the world at that time so the Continental Congress1 navy committee, headed by John Adams who became President after Washington, copied it as they set up our Navy. They adopted some British regulations with hardly a change in the wording. Our first Marine units patterned themselves after British marines.